A three/four bedroom recently extended house situated in large mature gardens in a delightful, unspoilt, rural location approximately two miles from Penzance. This spacious house which originally was a single story bungalow and has now been extensively extended by the present owners, now offers accommodation to comprise of two double bedrooms, one of which is ensuite, and a study on the first floor. 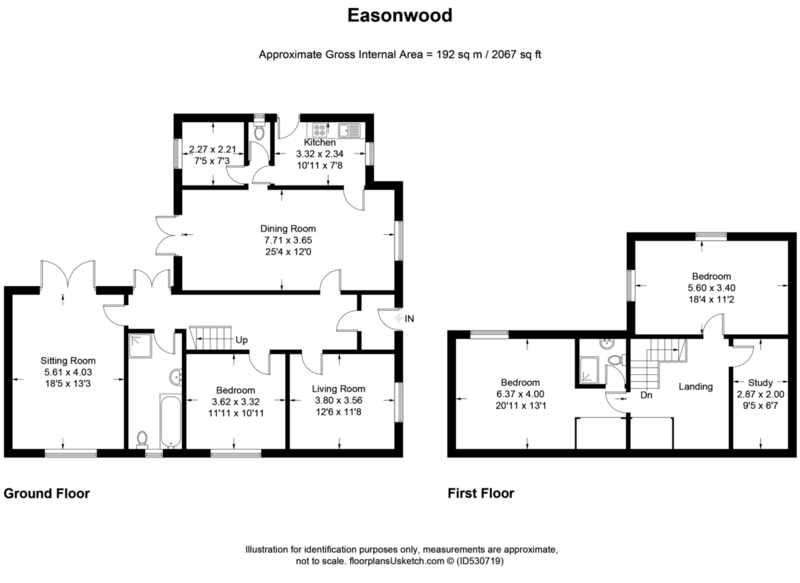 On the ground floor there is a further bedroom, sitting room/bedroom 4, large lounge, dining room, bathroom, kitchen, cloakroom and utility room. The property is offered with no onward chain and is double glazed where stated and oil fired centrally heated throughout. Approached over a private lane into the established gardens with detached garage and bordered by a stream and mature woodland, we would thoroughly recommend a viewing to fully appreciate this property and its delightful setting. MAIN HALLWAY: Solid wood floor, stairs rising with storage under, radiator, double glazed patio door to the rear. SITTING ROOM / BEDROOM 4: 11' 9" x 11' 9" (3.58m x 3.58m) Double glazed window to the front, radiator, fireplace to one wall. CLOAKROOM: Low level w.c., window to the side. UTILITY ROOM: 7' 3" x 6' 9" (2.21m x 2.06m) Double glazed window to the rear, plumbing for washing machine, freestanding boiler. BATHROOM: Double glazed window to the rear, inset spotlights, heated towel rail, tiled floors and wall, pedestal wash hand basin, tiled bath, fully tiled mains shower cubicle. BEDROOM 1: 12' 0" x 10' 4" (3.66m x 3.15m) Radiator, double glazed window to the side. LOUNGE: 17' 3" x 13' 2" (5.26m x 4.01m) Wood floor, double glazed window to the side and patio doors, radiator, fireplace to one wall with gas point. LANDING: Velux window to the side, built in cupboards with eaves space. ENSUITE: Fully tiled shower room with cubicle, w.c. and pedestal wash hand basin. BEDROOM 3: 12' 9" x 11' 2" (3.89m x 3.4m) Two Velux windows, storage in eaves space. STUDY: 9' 5" x 6' 7" (2.87m x 2.01m) Radiator. OUTSIDE: The property is approached through a private lane leading to the gardens and detached garage. The gardens to the front and rear are laid to lawn with areas of patio and established plant and shrub borders. They are enclosed by high level deciduous trees and bushes with a stream and established woodland. SERVICES: Mains water and electricity. Oil tank for heating and septic tank drainage.